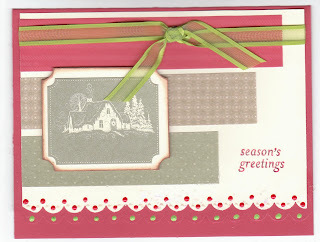 This Stampingbella is for my friend at my office. 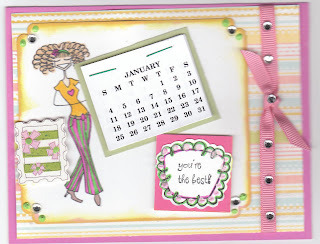 She's a "bling" kind of gal and I think will get a ki ck out of this calendar. The glitzy decorative paper is from Imaginisce "Color Me Happy" and picks up on all the colors I used with my Copics to fill in the stamped image. The little stripe with flower "stamp" on the left is from some embellishments I've had for a loooooong time (don't remember where it came from). I used the "jewels to enhance the main square and the ribbon. I also used 3-D paint in the corners, too. The second calendar is for a guy who also works in my office. Lovely As A Tree is the basis for this one. I used glossy white and rubbed on a graduation of color from Always Artichoke to Apricot Appeal to do a "wash". I then did the image with Versamark and embossed it with brown and did a little "fill in" with SU markers (Chocolate Chip and Always Artichoke). I set this all on dimensionals to make the whole calendar pop. The sentiment is from SU's Best Yet set (first time to use it). Hope you like these two calendars. 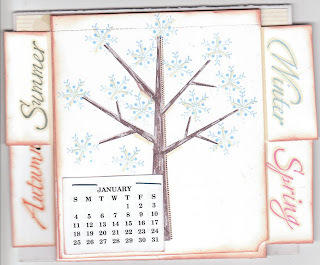 I still plan on doing more, but my new stamps have not yet shown up -- will have to get them "wet" later. Okay, all the gifts are bought, wrapped, and packed ready to go out the door, load in the car, and take them over to Susie's for our Christmas Eve celebration. I stopped by Subway Sandwich Shop and got our traditional sandwich trays ordered for pick up on Tuesday after work. I ordered one platter of turkey and one platter of roast beef both on wheat and a side tray of veggies (specifying the onions on a completely different plate ... a practice that we all learned the hard way from the first time we ordered). We'll combine these with different things brought in my Sara, Nancy, and Susan (chips, dip, salads, deserts, and drinks) and enjoy them throughout the day. I can hardly wait. I'll be off work from Wednesday until back at the office on Monday which makes for a nice break and a wonderful Holiday!! 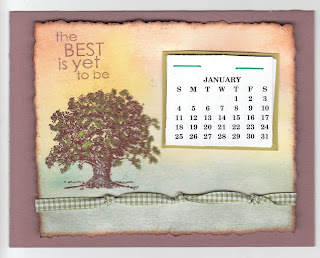 My next posting will be for little gifts I'm planning on making for friends, family, and Realtors in my office. I've started making some calendars that the Realtors can take home and use by their computers. Susan also gave me some book marker covers that I can also use. Wishing you all a MERRY CHRISTMAS and a NEW YEAR filled with hope and happiness! Both of these cards use the same theme on both. I love the serenity of these cards and the similar layouts. 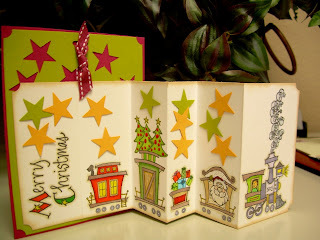 The larger one uses bars of decorative paper from the SU Simply Sent Handmade Holiday set. Both of the bigger and smaller card have scalloped edge on the bottom. The larger card has a self adhesive die cut with the house scene on it. 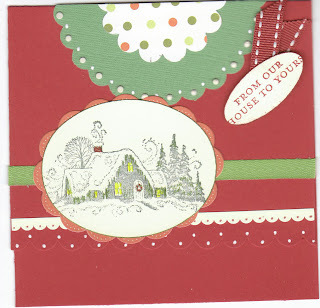 The smaller one was stamped with the house scene and then punched with the oval punch and adhered to the scallop oval die cut. 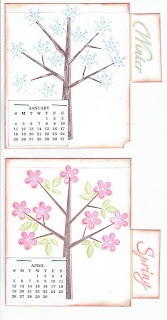 The scallops on the large card is accented with 3-D paint while the smaller is accented with a white gel pen on the bottom scallops and the lighter scallop strip is a die cut from the simply sent sheets. 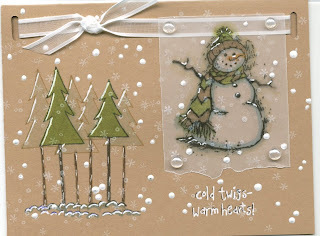 I just must share with you all this Christmas card from my dear friend, Lisa, (wife to my bosses' son, Ray). 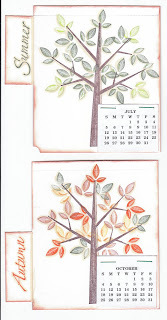 She is an amazing cardmaker, mom, wife, and Realtor. 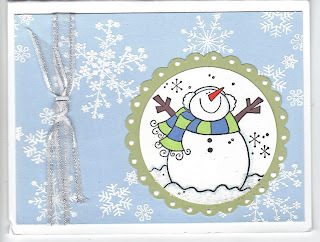 She has embossed the snowflakes, used her scallop circle punch, and accented her perfectly colored snowman image with glitter for the snow beneath him, and topped it all off with a sparkly ribbon from Michaels. IT IS ABSOLUTELY perfect irl!! Thank you, Lisa, for this terrific card. It made my day today.